At least you won't need new hardware. Sounds gimmicky. Unless they invent maybe a “scratchless” wax, smaller groves sound like a scratch would really impact it more. I figure also might need a smaller stylus. Had no idea about quality suffering from stampers after 1000 presses. Must be why my low-run vinyls, of around 500 copies pressed, tend to sound better than the more mass-produced stuff. Largely the reason why initial pressings - and promo pressings - have long been preferred to later pressings. I'll be interested to see how these sound, but don't see myself repurchasing any albums. I seriously doubt there will be "HD Vinyl" in stores in 2019. If you read the article, it's the startup that is developing the technology who is saying that timeline is possible. Even if they finalize all the technical details by October of this year, they still have to convince pressing facilities to upgrade to this process which will include the cost, logistics, and production line-disruption of upgrading. It sounds to me like they have a lot more work to do than just the remaining engineering. I've been shopping eBay for certain old albums to fill holes in my collection. It drives me nuts when sellers don't indicate whether or not it includes the lyric sheet or printed sleeve. There's an album I'm looking at now. I know for a fact that it came with a printed sleeve with the lyrics, but there is no picture of it on the auction listing (the seller has about ten photos of the jacket and record itself) and all the description says is that it has a clear sleeve. I don't so much care if a generic original sleeve has been replaced with another generic sleeve, but if it has unique graphics, lyrics, or band photos, I want it. Also, when the listing says it includes a clear sleeve doesn't indicate much. When I get an album with a printed sleeve I always replace it with a generic sleeve (and keep the original in the jacket next to the new sleeve) so the record doesn't split it. That's why I prefer Discogs to ebay, as the sellers there tend to have the correct version of the album under it's correct section with proper info, and will answer questions quickly. It’s RSD 2018!!! So anyone going? What do you hope to get or, what did ya get? My local store (Factory Records Costa Mesa, CA) opens at 5am, got there at 6am, to find 5 people in line (probably 8 inside, its a 400sf store)...Found everything I wanted except the Belly 10"
Since we have a week old baby, I decided to hit RSD late this year. My wife needs lots of help right now, obviously. We were up quite a bit of the early morning. So I swung into Waterloo about 10:30 AM during a Costco run today. They'd been open 2.5 hours already and as expected no Bowie Blackout or 12". No Johnny Cash either. I picked up a few of the 12" releases. Dr Dre, Brian Eno and Kevin Shields, Biggie, Marvin Gaye, Soft Cell. Didn't need Bowie Now! since I have an original , but went ahead and grabbed it. Went to four stores and couldn't find a copy of the Piper At The Gates Of Dawn or the American Dreamer Soundtrack. Got everything else I was looking for though. The Johnny Cash set would have been cool, but I knew it would go quick and I have very little desire to brave the crowds these days. Congrats to all that went out and got what they wanted! Didn't get the one I was after (Daughter - Music from Before the Storm), but a friend in another town grabbed it for me. Ordered a Canada-only release (Le Matos) as well. Picked up six non-RSD albums between two local stores. So not bad I guess. I was tempted to get all three "Vengeance" soundtracks, but the store I was at only had two of them, and I realized I didn't want them that bad anyway. I picked up the Oldboy soundtrack and the Soul Asylum live album, along with a few other non-RSD titles. I've been going to my local record shop for RSD since 2009 or 2010, and this was the first year I didn't get almost everything I was hoping for. And this was also the earliest I'd ever went in the day. 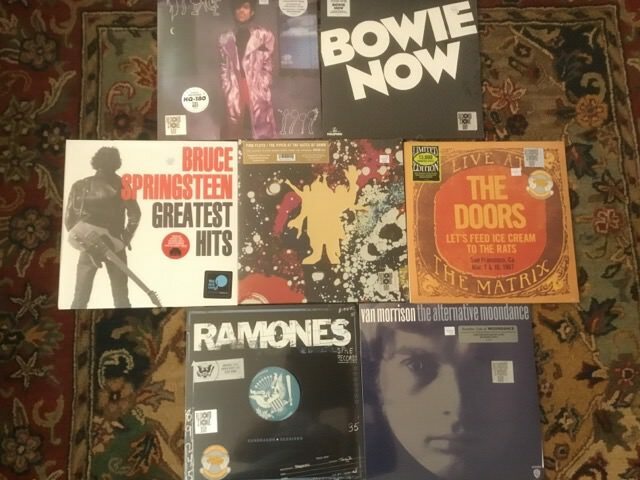 Almost forgot about RSD this morning but headed out and was able to get the Bowie records, Stooges and live Iggy. What’s up with that damn Pink Floyd being so hard to find? Because Pink Floyd always sells, and flippers know that. It pisses me off, but I'm not going to lose sleep over it. Most of my other wants are RSD-First releases, so I'll just wait until they get wide releases.